A member of Epping Meeting wrote up her experience of a campaign march and it was published in the Friend (1 Dec 2011). It is reproduced here with their permission. Text and photos by Christine Downes-Grainger. Many heads turned to read the banners. Mobile homes are marketed as a downsizing option for retirement, mainly in rural locations surrounded by like-minded people. In our case, they were the only type of property we could afford close to family in London. The law protecting people living in them is weak. The 1983 Mobile Homes Act classes the building as chattels, although we pay council tax, and allows the site owner to withhold approval of new buyers. Councils have no power to stop the granting of a site licence, even to applicants with convictions. The case of Ladycroft Park in Oxfordshire received media attention in 2005 when the residents of the village of Blewbury developed a Silent Witness campaign to support elderly residents being bullied by the new owner. They also raised funds to take him to court. My site near Epping Forest is owned by the same family. In 2009 the site owners of The Glen in Worcestershire received prison sentences for intimidation and harrassment following arson attacks on people’s homes. In the committee room of the House of Commons, residents expressed their frustration at the lack of progress. 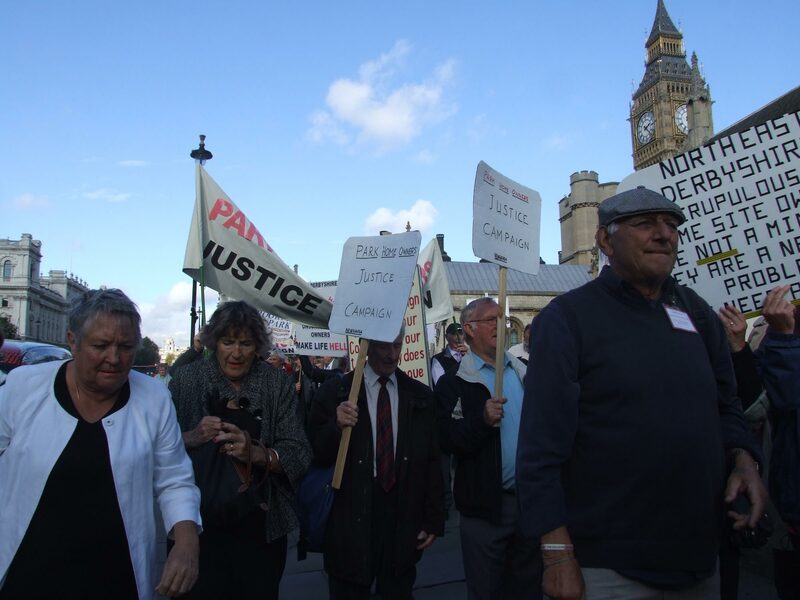 MPs from the All Party Parliamentary Group on Mobile Homes explained that the election, and the present government’s focus on economic cuts, was the reason. Plans had been advanced under Labour for a ‘Fit and Proper Person’ test for all park owners. A complete reform of the outdated 1983 Mobile Homes Act is needed. The campaign received questionnaire replies from 803 parks, forty percent of the estimated 2,000 park in the UK. They showed that 23,473 homes are living under the regimes of unscrupulous park owners, many of whom were reported as being aggressive, abusive, violent and dishonest. A service charge is prepaid to the park owners by the residents in their monthly pitch fee, but often site maintenance is not carried out. There is bullying of residents, intimidation and harassment, as well as gas, water, electricity, and health and safety issues. These statistics were handed in to Downing Street and sent to every MP. We are still waiting for a law. Christine is a member of Epping Meeting. This entry was posted in Uncategorized and tagged Epping Quakers, social action. Bookmark the permalink.